I arrived in Malaysia without many expectations, or fear. Mainly because I have lived in other Asian countries before, I thought I knew what I would be experiencing. To some degree, I was right. But as time rolled on and my family life was getting settled in an area called “Ampang” in Kuala Lumpur, I began to see how Malaysia can be – Truly Asia. There is something about Malaysia that is unique compared to the other Asian countries. My family is leaving Malaysia to go back to U.S. I thought it would be nice to gather up a few photos of my family experiences as a keepsake and to share with you. I only wish that I could spend more time to explore the beauties of this country. Two years seems too short and it flew lightening fast. My family spent a few days in a east coast area called Kuala Terengganu and visited the nearby island called Pulau Tenggol. This is a small island off the coast of Terengganu. 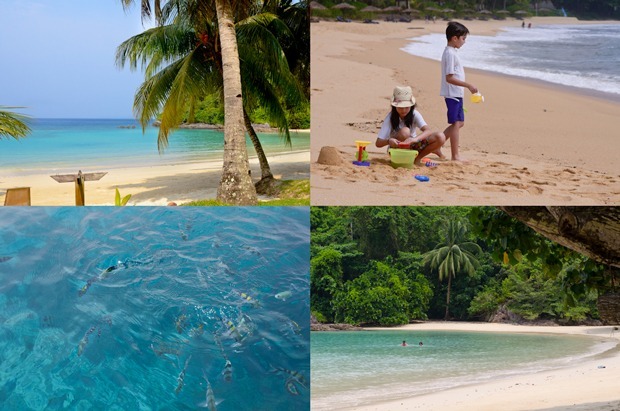 It is not very well known to the most tourists, unlike nearby Pulau Perhetian or Pulau Redang. 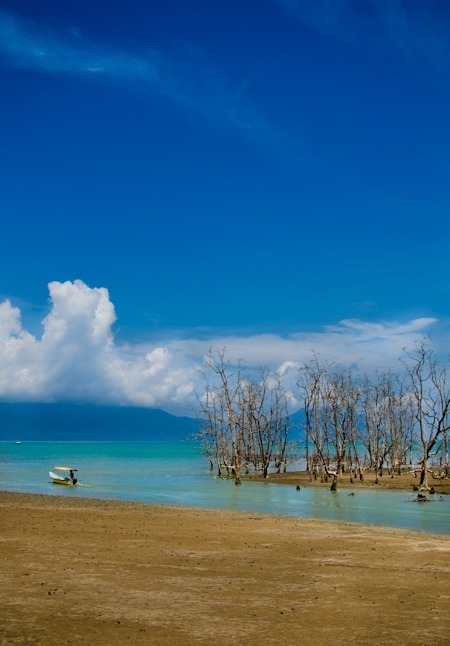 The marine life on the island was amazing and a well-kept secret to passionate divers and snorkelers. We didn’t see any inhabitants or residences on the island. The resort we stayed in Kuala Terengganu provided a private boat to access to this island and we had an entire island to my family for a day with 3 other guests, and a chef who cooked a meal for us on the beach. Can you see the emerald colored clean water off the beach? You can see through the corals in the water. In the water of island of Tenggol, we saw turtles, loads of beautiful corals, and the colorful tropical fishes (Nemo and Dory included :)). The water was warm and swimming in the beach was pleasant. I always love to observe the daily life of the locals in every country I visit. When we first arrived in Malaysia late July, it was during the Ramadan which is the local Muslim’s fasting period for one month. They fast from the sunrise to sunset. The dinner on our first day in Malaysia had to be taken care of at the restaurant. We went out to look for one at 7pm (which was just right after the sunset) but failed to find one because most restaurant we went to were fully occupied with very hungry locals and no seats were available for us. The traffic on the road was extremely jammed. Very tired and hungry, we hoped to eat Malaysian food as our first meal but ended up eating at the Kenny Rogers chicken rotisserie (the American style roast chicken restaurant) 2 hours after we left our place. Lessons learned. Then, we woke up very early next morning with the sound of prayer from the nearby mosque. I finally realized that I was not in “Kansas” anymore. LOL! Malaysia is a Islamic country. However Malaysia consists of quite a number of Chinese, Indian and other ethnic groups with different religions and traditions all over the land. There are neighborhoods that are heavily populated with one or more ethnic groups, so we have a chance to soak up the cultural scene and its atmosphere. 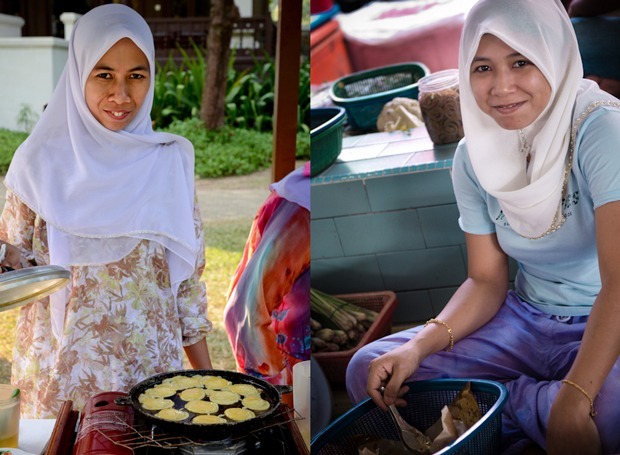 Most Malay ladies wears a head drape called “Hijab”. Many locals drive motorbikes. Driving in Kuala Lumpur during rush hour is crazy but that is the same case with any metropolitan cities around the world. 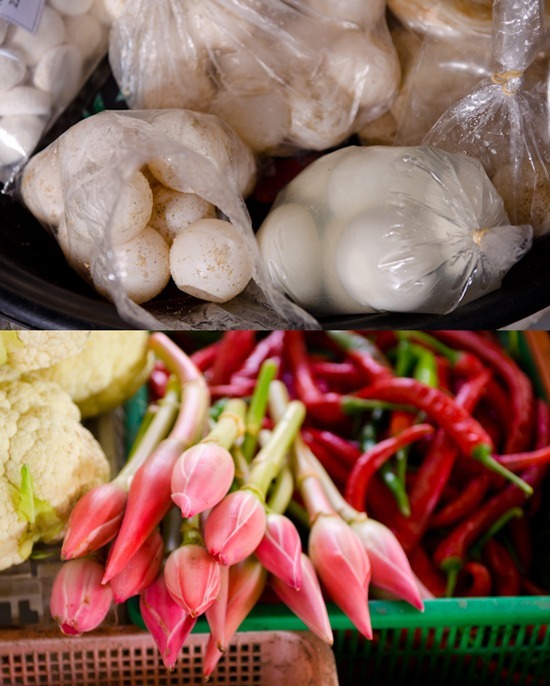 It is fun to visit local market to see the vivid colors of life and taste the flavor of what the locals eat at their mamak stalls. Malay people are kind and easy going. I often find that they are funny, too. I was at the market one day taking some pictures. One lady approach to me and told me that I had a very nice camera. I politely replied “Terima Kasih”, which means thank you in Bahasa Malay. Then, she bluntly said to me, “Your Malay is horrible! You better eat some more Malay food!”. I had to laugh so hard on her comment. I totally agreed with her on my poor Malay language skill but she was the only person who reminded me of that. 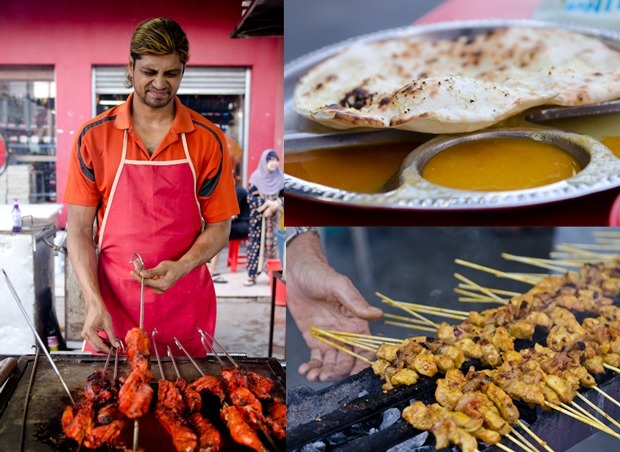 One of the best experience I had in Malaysia is indulging its multicultural food. 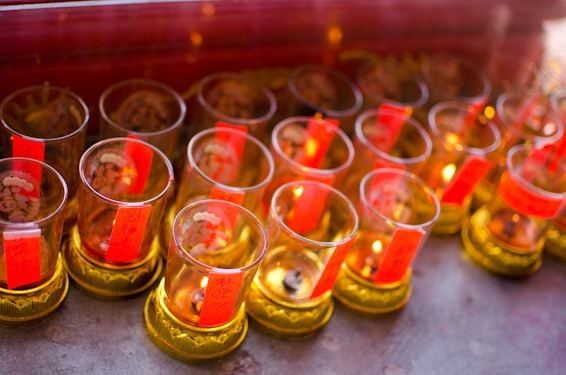 With influences from Indian and Chinese community in the country, there are so much to choose from. 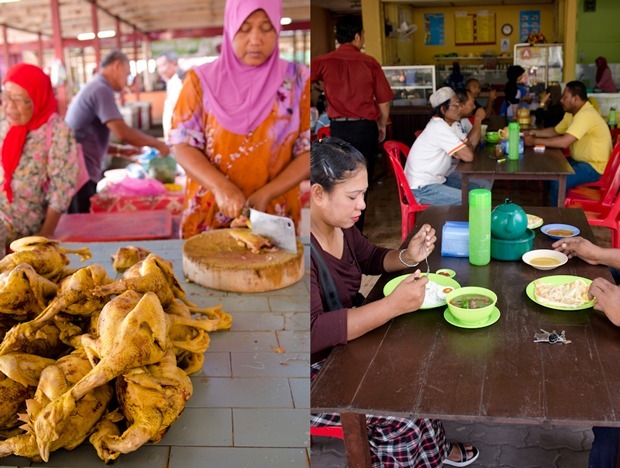 This is my family’s favorite mamak stall located in Ampang, just across from Ampang point. 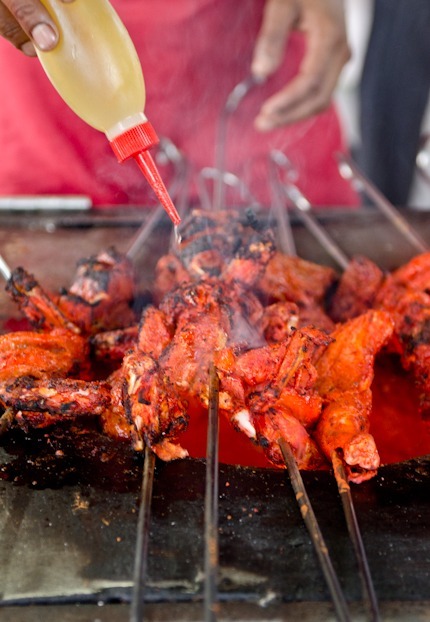 Their tandoori chicken is by far the BEST we had eaten. The chicken sate is great, too. My daughter loves Char Siu which is honey BBQ pork, and our family often visited to this hawker center famous for its Char Siu. You have to be there right at the moment, 11:30am, when they are open for lunch. Otherwise there will be a long line of people waiting for their turn to order. Very cheap and delicious. I love their Pan Mee, the flat rice noodles with minced pork and fried anchovies. Yum!!! Roti is very popular Indian flat bread that comes with variety of its kind. 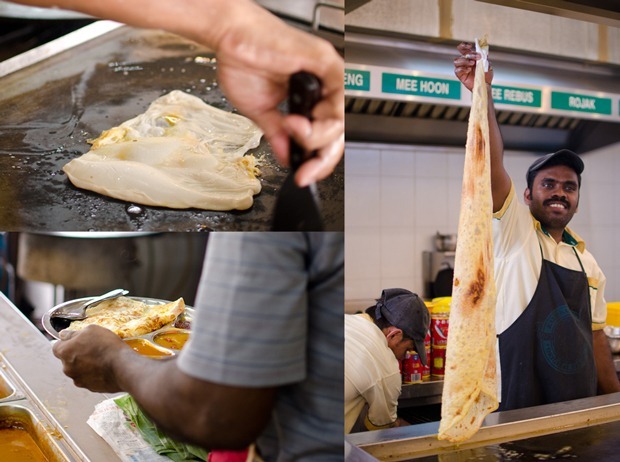 Roti Canai is the basic kind that is served with simple curries. You can add banana, sugar, garlic, onion, or anything you like to make either sweet or savory. Perfect breakfast and delicious! 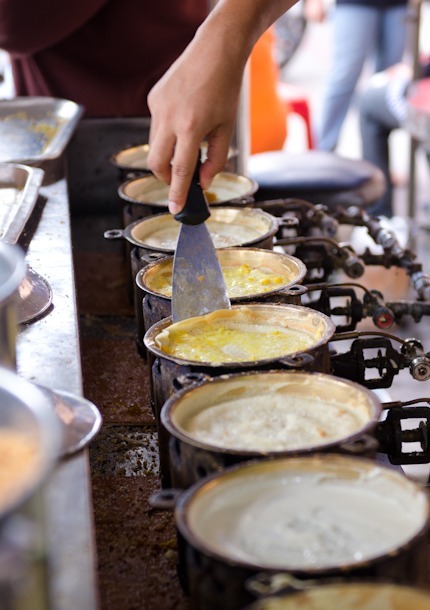 Appam is a crepe like dessert often spread with different types of sweet or savory filling. Quite delicious. My favorite Malay dessert has to be Akok, though. I would love to get a recipe. You can’t say you have traveled in Malaysia if you haven’t visited Penang. 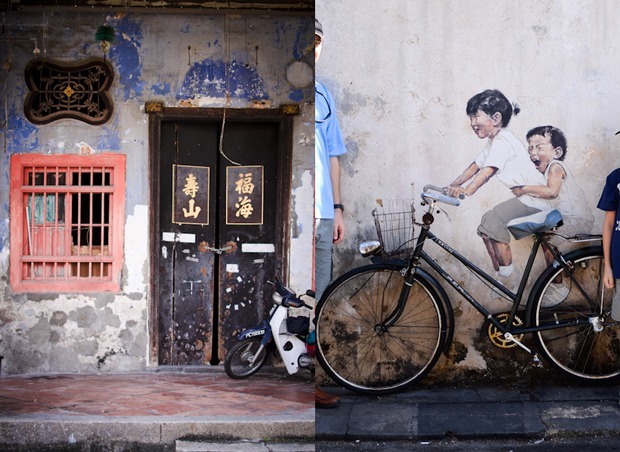 Penang is city that captures old world charm of East meets West with Chinese influence. Penang is an island state off the northwest part of western peninsula of Malaysia. Georgetown is the capital of the island and the UNESCO heritage site. You can easily stroll around the town to see its colorful heritage and learn the history. 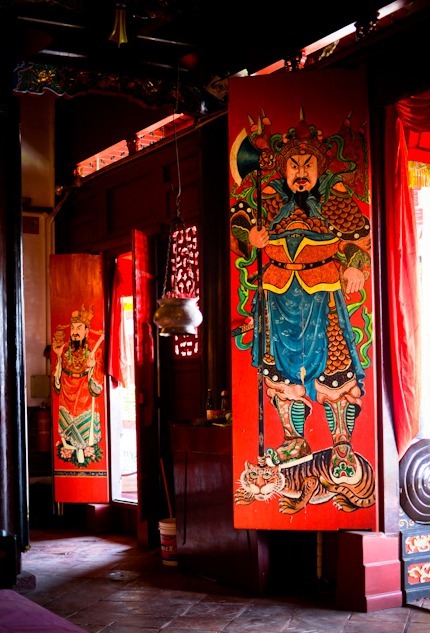 Look for interesting temples, mansions, street wall artworks, adorned rickshaws and the famous hawker food street. 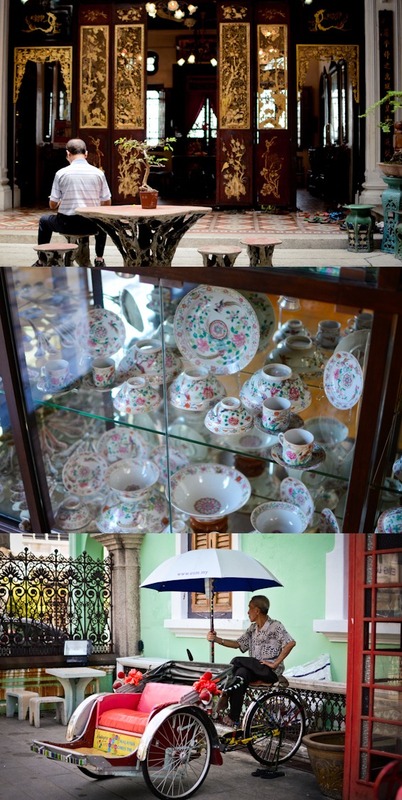 Top: a man reading a paper at Pinang Peranakan Mansion (A wonderful place to learn about Baba Nonya heritage). 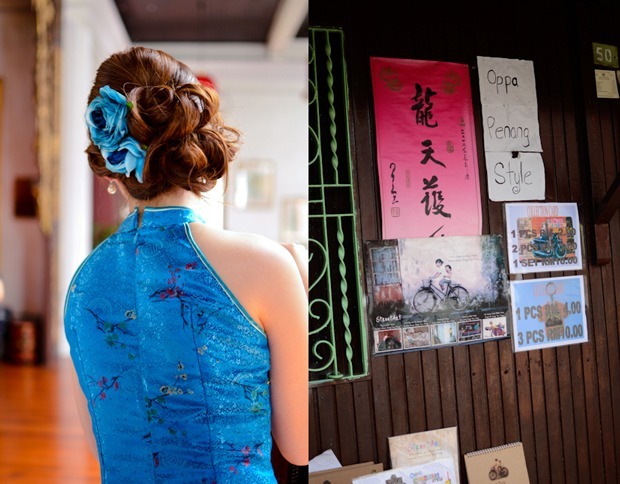 A lady wearing a beautful cheongsam was posing for a picture. Loved her matching hairdo. Yeah.., It is absolutely Penang style!!! Go Penang! 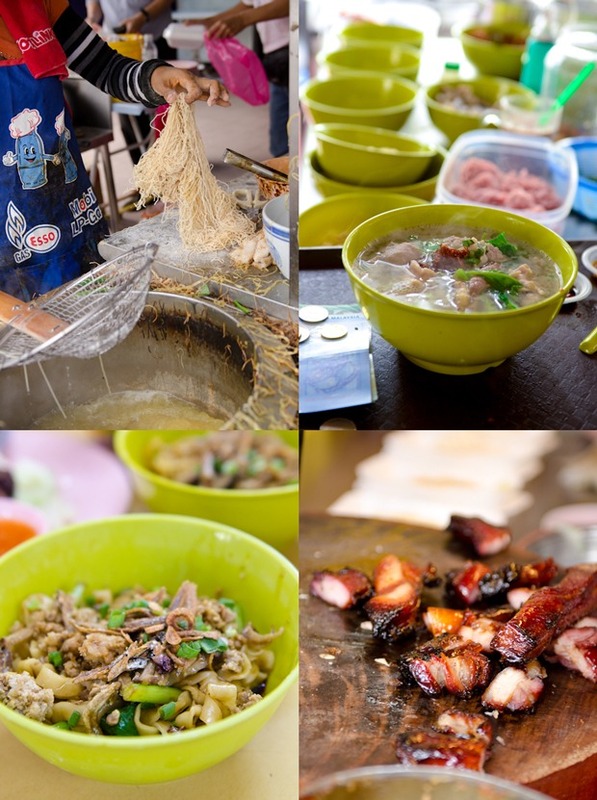 You can’t stroll around Penang without eating the famous Penang style food. 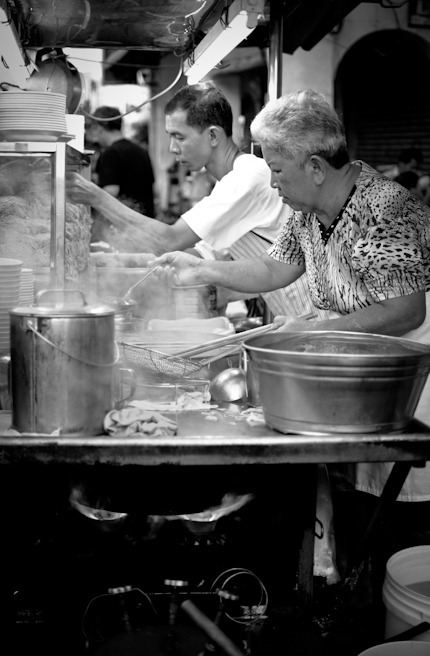 It is fun to watch how these hawker chefs make their food on the street and you will never get bored. It is entertaining! 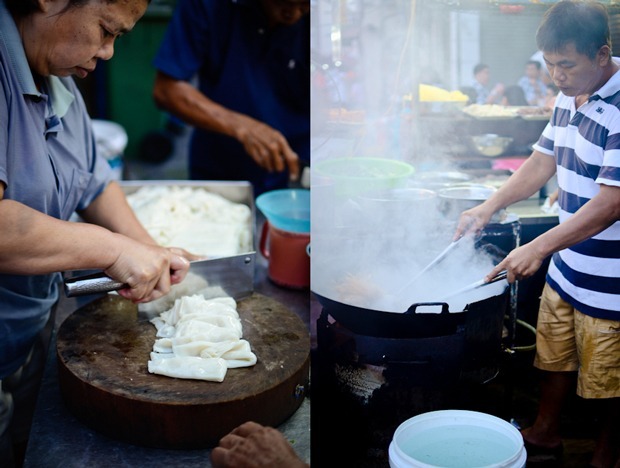 Left: A lady slicing the flat rice noodles. I totally fell in love with Penang Asam Laksa, which is quite different than most curry Laksa. Penang Laksa is sour and pungent, and spicy. It is a fish-base noodle soup with tamarind, ginger and pineapple. Just thinking about it makes my mouth water. 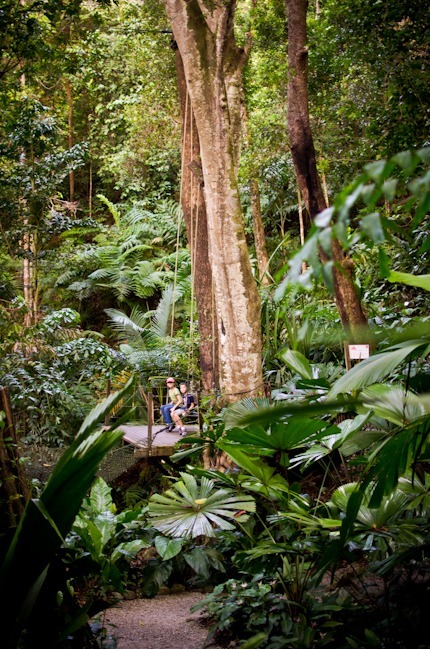 There is a beautiful botanical garden in Penang that are great for kids to roam around. Make sure you are well protected with a good mosquito repellent. The mosquitoes were ferocious! Sarawak is on the island of Borneo, which is on the east Malaysian peninsula. Many ethnic groups including Iban, Chinese, Malay, Melanau, Bidayuh, and Orang Ulu are living in Sarawak with their unique languages and the cultures. 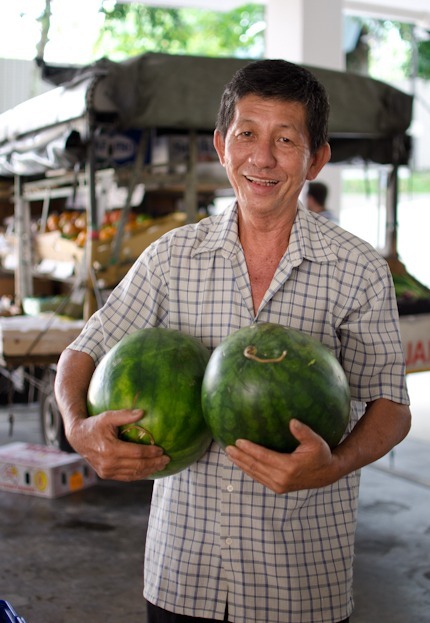 Visiting Sarawak cultural village is a great way to learn about their ways of life. We loved seeing the ethnic tribal houses, their costumes, and played with their tools of daily life. Browsing through the souvenir shop is always fun thing to do. 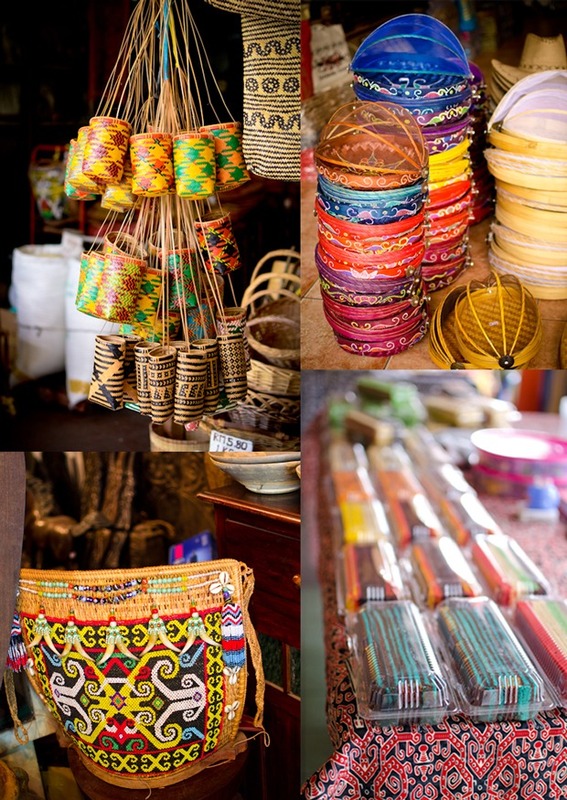 I especially loved the baby carrying basket adorned with colorful beads. 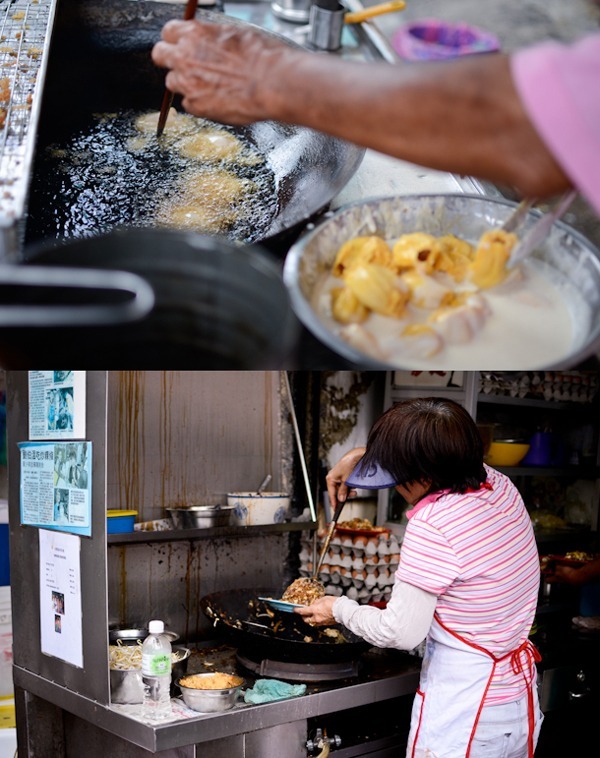 Bottom right photo was the stripped cakes which supposedly famous in Sarawak but have not tried. Jungle trekking is a must thing to do in Sarawak. We took a jetty to a place call Bako and started trekking. 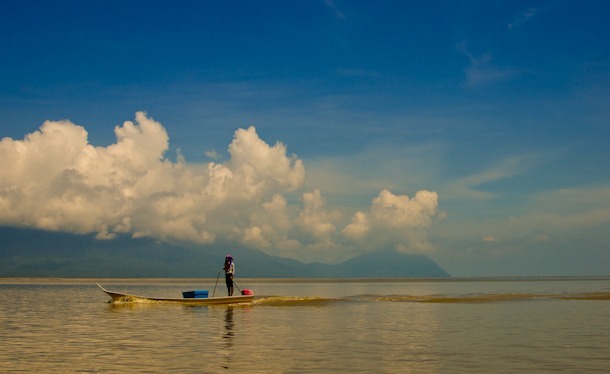 You can get a trekking route as short as 1 hour or as long as 3 days to explore the island of Borneo. If you are taking a long trekking route, it is wise to do it as a group since the Borneo jungle can be quite harsh. Yes, you will feel like you are in the scene of “Indiana Jones”, if I can exaggerate. 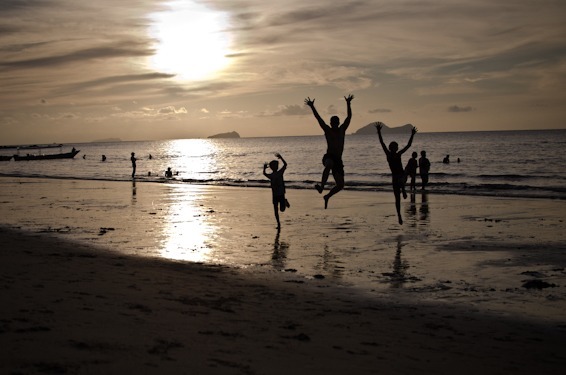 Goofing around the beach at the end of the day in the sunset is memorable. Damai beach was a great place to see the sun setting behind the waterline. Well, I could show ton of more pictures of Malaysia but better to end here. Last but not least, I would like to give a special thanks to my vegetable-n-fruit peddler who comes twice a week to our condo to deliver the freshest produce with his truck. His name is Mr. Po. He asked me to put his picture on my blog so people can recognize him, which we hope to bring more business to him. He even suggested me to take a video of him to put on Youtube. LOL!!! His produce is top-class and I especially loved his salmon. Always greeting me with a big smile, my recipe blogging was so much easier with his service. I will miss him dearly. I hope you enjoyed my photo journal of Malaysia. I don’t know when I will ever come back to this beautiful country but the memory will always stay with me and my family. Thank you for the lovely pictures of this area of the world and the people there. Wishing you safe journey and a good time settling in to your next home. I look forward to your next recipes and adventures. Hi Holly, I'm Malaysian Living in KL. This is a fantastic post and you make me so proud to be Malaysian. Do you mind sharing Mr Po's contacts? I'd love to have him deliver to my place too. Have a safe trip back to the US! Hi Holly, I'm a Malaysian living in KL. This is a fantastic post and you make me so proud to be Malaysian. Do you mind sharing Mr Po's contacts? I'd love to have him deliver to my place too. Have a safe trip back to the US! 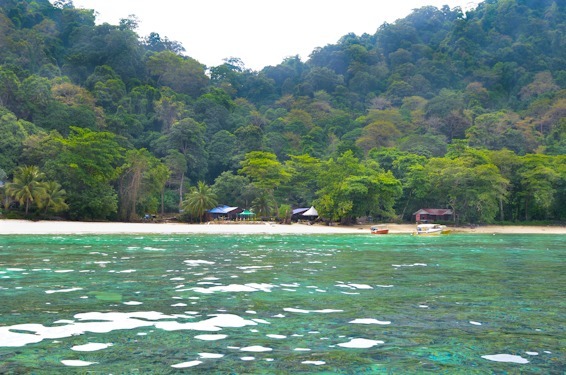 Please let me know what resort did you stay a Kuala Terengganu that has a boat to take you over to Tenggol island. We are in CA and always love to go to Malaysia for vacationing. Thanks for sharing your story above. The resort is called Tanjung Jara in Kuala Terengganu. It is a lovely small resort with distinctive Malay architecture and decor. They provide all kinds of activity you can choose from. My family loved our vacation there. What a fantastic write-up! Malaysia has been on my list for a while now, and I really hope to go someday. What a great time you had in Malaysia! How lucky to be able to live there for a couple of years. Really love all of the pictures and descriptions - so generous of you to share all of this with us. Mr. Po looks like a real find! Really fun post - thanks so much. Thanks for sharing. What a beautiful place! And the food..wow...I hope I can go there someday. Waa Holly. Farewell to you too... BTW, I never thought you will stay in Malaysia for only two years. Pleasure experience and good info while reading your blog. Pls continue to blog K-Food recipe. Best of luck! Reading this post makes me miss my home country so much....all the yummy food, and I must visit Terengganu the next time I go home. Holly, your blog brings back many lovely food memories for me. I am a Singaporean, currently living in TX for the past 25 years. Have a safe trip back to US and do continue blogging. Thank you for sharig... Sarawak is really a good place for vacation planning! May God be with you and your family as your travel back to US. Enjoy reading your post and hope you will continue to blog! Like your blog (a lot). Please continue after you settle in the US. Have a safe and pleasant move. Beautiful post, Holly! I can tell you'll miss this vibrant place. Thanks for sharing a glimpse of it with us. Hi Holly, I am from Penang, residing in Spore and I have yet to visit Sarawak, and You have. lol. Your post makes me miss my Assam Laksa so much....! Have a safe trip back to US and looking forward to checking your blog for more recipes. Isn't Malaysia amazing? The beauty of the landscape, the food and the people really took us by surprise. We can't wait to get back there sometime! Thank you Holly for sharing and making me wise on visiting the country. Ii have plans to visit Malasia somewhere by end september and your photographic post will definitely help me in guiding me through and through. Stay Blessed. Have just been to KL a few weeks ago and we stayed near Ampang Park - is this near where you used to live? Reading this post takes me back to our Malaysian trip and makes me miss the place even more! Yea, I lived in the Ampang area near the Great Eastern mall. I already miss KL.